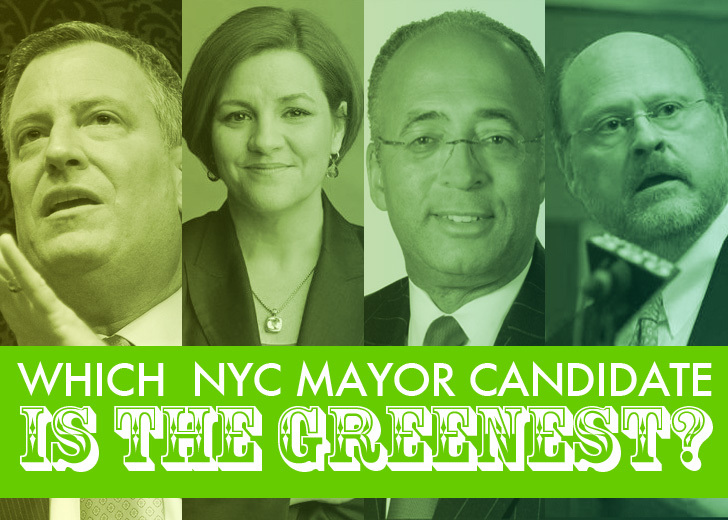 Which NYC Mayoral Candidate Would Make the Greenest New York City Mayor? Say what you want about iconoclast NYC Mayor Michael Bloomberg – but no one can accuse him of being soft when it comes to the environment. The three-term billionaire technocrat scored numerous environmental victories during his 12 year tenure; from launching the nation’s largest urban public bike-share program to the creation of wildly popular and successful new green spaces like the High Line in Chelsea and the revitalization of derelict waterfront space at Brooklyn Bridge Park, from controversial health initiatives (like banning giant sodas), to the inspiringly ambitious environmental blueprint for New York: PlanNYC. Sadly, Bloomberg’s term is almost over and it’s time to choose a new mayor to walk in Bloomberg’s bright green footsteps. The mayoral primaries are tomorrow (September 10th). So which of the current mayoral candidates stands a chance at capturing some of the green goodness that made us love Mike so? The current leader of the Democrat pack, Bill de Blasio has spent much of his campaign time talking about stop-and-frisk, education and economic inequality in NYC, yet has been relatively quiet about the sustainability initiatives he plans to implement in the city if he is elected. He did, however, release a PDF document called A Framework for a Sustainable City detailing his green plans. The outline includes building an alliance for a sustainable New York as a way to continue PlaNYC, creating more green jobs, retrofitting existing buildings to be more energy-efficient, bolstering recycling, boosting green job training, focusing on resilience by restoring waterways and creating more soft infrastructure, expanding composting, supporting a fair plan to manage solid waste, establishing gateless tolling at NYC bridges and tunnels, supporting smart grid and smart meter deployment and upholding the moratoriam on fracking. In addition to these future initiatives, De Blasio also has a history of co-sponsoring legislation to offer incentives for green buildings and has worked to improve the city’s air quality by pushing for the implementation of similar motor vehicle emissions standards as the ones used in California. As a City Council member, de Blasio has also pushed for cutting government use of styrofoam and led the charge on a plan that requires manufacturers to comply with stricter standards for e-waste disposal. He’s running as the most liberal progressive of the democratic candidates, and we hope this means he’ll be progressive when it comes to the environment as well. Bill Thompson hasn’t exactly put his commitment to the environment in the spotlight, but he does have a notable track record when it comes to sustainability and linking green practices to corporate profitability (which sounds a bit like our current mayor’s stance). Thompson is anti-fracking and has worked to limit natural gas drilling in New York. He has also called for the conservation of wildlife at the Ridgewood Reservoir along the Brooklyn-Queens border and highlighted the impacts of area airports on air quality and water quality. Thompson has fought to bring the effects of climate change to light, and urged firms in NYC’s investment portfolio to issue “sustainability reports” detailing the impacts of their businesses on the environment to investors. Thompson was also a supporter of the “Bigger Better Bottle Bill”, which added non-carbonated beverages to the bottle return law, encouraging recycling and saving NYC millions. Christine Quinn is running for mayor as the heir apparent to Mike Bloomberg and thought by many to be the candidate that, if elected, who would most closely continue the initiatives laid out by Bloomie, including environmental ones. During her time as City Council Speaker, Quinn achieved many green goals including passing the Climate Protection Act, which requires the city to reduce greenhouse gas emissions by 30% by 2030, passing the first laws in the U.S. to green city buildings and a new Solid Waste Management law that diverts thousands of tons of waste every day from overburdened NYC neighborhoods. She also helped to expand city recycling to include e-waste, plastic shopping bags, clothing, and rigid plastic, and worked to increase recycling bins in public spaces and bring composting to all five boroughs. And the list goes on… She helped provide funding to preserve tens of thousands of acres in the city’s watershed, removed cars from the road by providing better access to green transportation, passed laws requiring city buildings to use cleaner heating oil, and funded repairs to many public parks and playgrounds. Ms. Quinn has also been a strong voice against fracking in New York and she is the only candidate that was endorsed by the New York League of Conservation Voters. Quinn’s endorsement by the NYLCV and the New York Times convinces us of her strong green cred. So far, Republican candidate Joe Lhota has focused his campaign tightly around boosting the economy and jobs, education, public safety and government efficiency, and we haven’t seen much from him in terms of the environment. However, he did serve as Chairman and CEO of the MTA from 2011-2012, so he’s no stranger to public transporation and it’s possible that he will shift some of his focus towards green initiatives if he’s actually elected. So who do you think is the greenest mayoral candidate? Tell us by voting in the poll below. Which is your favorite green energy story of 2009? DeBlasio also cares about animals, don't forget which is an important aspect of sustainability. He wants to outlaw the cruel Carriage Horses and vastly improve the shelter system. Both his kids are vegetarians. Quinn couldn't care less about animals. Say what you want about iconoclast NYC Mayor Michael Bloomberg - but no one can accuse him of being soft when it comes to the environment. The three-term billionaire technocrat scored numerous environmental victories during his 12 year tenure; from launching the nation's largest urban public bike-share program to the creation of wildly popular and successful new green spaces like the High Line in Chelsea and the revitalization of derelict waterfront space at Brooklyn Bridge Park, from controversial health initiatives (like banning giant sodas), to the inspiringly ambitious environmental blueprint for New York: PlanNYC. Sadly, Bloomberg’s term is almost over and it’s time to choose a new mayor to walk in Bloomberg’s bright green footsteps. The mayoral primaries are tomorrow (September 10th). So which of the current mayoral candidates stands a chance at capturing some of the green goodness that made us love Mike so?